Will New Laws Help Russia Take Down the Mafia? The raid looked like something out of a Hollywood action movie. 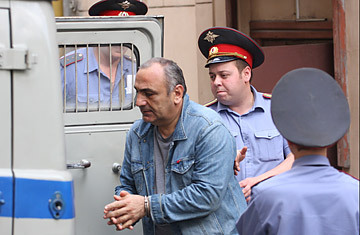 On July 7, Russian special forces dropped down on ropes from a helicopter to storm a luxury yacht on the Pirogovsky reservoir outside Moscow, arresting three dozen mobsters, including the group's alleged ringleader, Tariel Oniani. But within days, nearly all of them, including Oniani, had to be set free because prosecutors couldn't charge them with anything. Russia's laws have long been weak and unspecific when it comes to combating organized crime, part of the reason that the underworld has thrived in the country in the post-communism years. But the government may finally be getting serious about cracking down on the mafia. In the wake of the embarrassing release of the mobsters in September, President Dmitri Medvedev proposed harsh new legislation targeting organized-crime figures, making a rare admission that "the legal code does not have a response to the increasing social dangers of these crimes." Within weeks, the parliament approved the measures by an almost unanimous vote. Perhaps most significantly, one of the new laws is aimed directly at the powerful heads of Russia's various mafia clans, who rarely get their own hands dirty. Under the statute, leading an underground criminal group is now punishable by life in prison. "As a rule, [the dons] don't directly participate in criminal acts, and so they go unpunished," Oleg Morozov, deputy speaker of Russia's lower house of parliament, wrote last month on his party's website. "The president's legislation gives more precise definitions of what can be called a criminal conspiracy and a criminal organization." Another new law makes it illegal for mobsters to meet to discuss their operations or planned criminal activities, an act punishable by up to 20 years in prison. This provision seems to be linked to the incident on Oniani's yacht; under the new statute, the men would have faced charges just for showing up for the meeting. According to local law-enforcement officials who were quoted in the Russia media, the purpose of the gathering was to discuss Oniani's turf war with Aslan Usoyan, leader of a rival clan in Moscow. Weeks later, the reputed godfather of the Russian mafia, 69-year-old Vladislav Ivankov, was shot in the stomach in northern Moscow by a sniper who fired across eight lanes of traffic. Ivankov, who died on Oct. 9 after spending two months in the hospital, had recently sided with Usoyan in a dispute with Oniani over control of lucrative rackets in Moscow. Given how entrenched Russia's organized-crime syndicates have become in recent years, some experts question whether the new laws will do any good. According to a report that accompanied Medvedev's proposal, the number of criminal incidents linked to the mafia increased 32% from 2006 to 2008. Last year alone, the number of "grievous or especially grievous" offenses committed by the mob  contract killings and kidnappings  climbed almost 10%. So even if the reigning dons do get locked up, replacements will likely be easy to find and the violence will probably continue, says Yury Fedoseyev, former head of Moscow's Criminal Investigation Department. "The men I put away in the early 1990s for extortion, racketeering, murder  they're all getting out now," he says. "And I doubt they're going to retire." With Ivankov's killing, too, the conditions are ripe for an all-out war between the Oniani and Usoyan factions, authorities say. Police say the tensions between the two men date back to 2007, two years after Oniani returned to Russia from Spain when police broke up his racketeering operations there. As Oniani sought to re-establish himself in Moscow, he started encroaching on Usoyan's territory, and Usoyan's top lieutenants began turning up dead. One of them, Alek Minalyan, an Armenian allegedly in charge of extorting money from construction firms working on projects for the 2014 Winter Olympics in Sochi, was gunned down in western Moscow on Feb. 6. The bodies of two others, Andrei Golubev and an unidentified associate, were found riddled with bullets in eastern Moscow on May 22. Then came the hit on Ivankov. Known by the nickname "Yaponchik," or "Little Japanese," because of his Asian appearance, Ivankov was considered by both Russian and Western law enforcement to be one of the most influential figures in the Russian criminal world. According to the FBI, he ran an international mafia syndicate from his apartment in the Brighton Beach neighborhood of Brooklyn, N.Y., in the 1990s and served eight years in prison in the U.S. for extortion and conspiracy. When he returned to Moscow following his release in 2004, he was set on retiring. "I met with him a few times, and he told me honestly that all he wanted in Russia was to rest," says Alexander Dobrovinsky, a Moscow attorney and an old friend of Ivankov's who helped prepare the defense for his trial in New York. "He was not a young man anymore." But that was easier said than done. Because of his reputation, local bosses still turned to him as an arbiter in their disputes. And according to police, he sided with the older and more established Usoyan in the turf war with Oniani. "In the eyes of these young and ambitious guys [like Oniani], Ivankov is a relic," Fedoseyev tells TIME. "He was away for many years, and here he goes getting involved in their business." The brazenness of the hit on Ivankov suggests that Russia's mobsters are acting with greater impunity and disregard for the law. The government now faces a major test: it needs to back up its new laws with determined action, or risk losing control of the streets to the ever-more-powerful mafia clans for good. Read "Busting the Sicilian Mafia's Board of Directors." See TIME's favorite episodes of The Sopranos.